Your food and drink selection are excellent only surpassed by the quality of your staff who were all friendly and efficient and made us very welcome. The only downside is the en suite facilities which are cramped. Apart from that we would recommend a visit to your lovely place. Many thanks . Friendly and accommodating family-run business located on the edge of a beautiful village not far from the A1. The bar serves a great selection of beers and the food has never been anything short of fantastic. The locally-sourced breakfasts are to die for. Excellent value and always reliable. Great food, great atmosphere, wonderful service. To all your staff: well done! We will be coming here again. Rare to find an authentic pub. Nice community hub. Nick and all the staff were most welcoming and helpful to our family party. Excellent dinner and 2 excellent breakfasts. Thanks to all the team for making our weekend such fun. Check your inbox or spam folder now to confirm your subscription. You're not on the list until you confirm. Winter lunch? Have 20% off on us! Doing Dry January?We’ve got you covered! Stay with us for Twixmas! 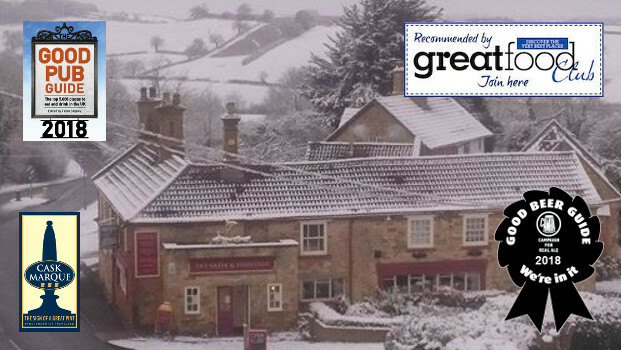 Welcome to the Geese and Fountain, a traditional, friendly village pub on the A607 between Grantham and Melton Mowbray in the village of Croxton Kerrial. We offer a wide selection of locally sourced food and drink, a quiet and welcoming atmosphere, and comfortable accommodation. There is no juke box or fruit machine, but regular live music and a monthly folk club supplement the hum of conversation. We welcome dogs, children, cyclists and walkers, and we’re listed in the 2018 editions of both the CAMRA Good Beer Guide and the Good Pub Guide. We were thrilled to have been awarded the Vale of Belvoir CAMRA Branch ‘Leicestershire Pub of the Year’ title for 2017, and to go one better in 2018, winning the title of ‘Vale of Belvoir CAMRA Branch – Overall Pub Of The Year’. Interested in the latest news and offers? Check here. We serve a wide choice of local ales, lagers and ciders, and an extensive selection of beers in bottles and cans. We have a carefully-selected wine list comprising 100% organic wines from both Europe and the New World. Our food starts out with top quality and distinctive local ingredients. Farms from Croxton Kerrial itself, and the neighbouring villages, provide beef, pork, hogget, venison, sausages, milk, cream, chicken, turkeys and of course geese. Cheese comes from dairies in the Vale of Belvoir, and vegetables and fruit when in season from farms in Nottinghamshire, Lincolnshire and Leicestershire. We strive to present these ingredients in dishes that will satisfy all your senses. We work with some very special suppliers to secure the best in local ingredients. Reservations can be made on 01476 870350. We have seven en suite B&B rooms, each one with its own individual character. Whether you’re staying for one night as you travel past, or a whole week exploring the Vale or surrounding area, we’d love to look after you. We hope you find the information you’re looking for on our website. Feel free to contact us if you need something specific. We look forward to welcoming you to the Geese and Fountain very soon.